This activity enables you to insert a no-operation instruction into a process. This activity is useful when you must use an activity that does nothing (for example, when a fault must be caught and suppressed). Figure A-12 shows the Empty dialog in BPEL 1.1. 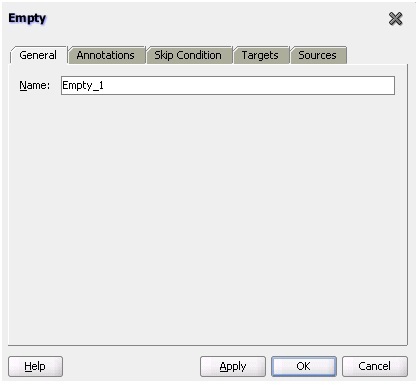 In BPEL 2.0, the Empty dialog includes a Documentation tab and does not include a Skip Condition tab.